For maximum capacity, the Quad Hi-Density Bike Rack™ offers space-efficient bike parking with two tiers. Easy to load, simply place bike into the innovative wheel guide and roll along the channel to secure the wheel and frame in place. Bicycles can be locked with a pivot locking bar for added security. Each Hi-Density Bike Rack allows double tier parking to hold four bicycles, the modular design allows for one- or two-sided capacity with multiple configurations to customize for any location. Easy to assemble, constructed with zinc primer TGIC polyester powder coat finish steel tubing and UV plastic wheel gutters for durability. Minimal moving parts also increase access aisles with less maintenance or liability concerns associated with movable tray racks. This innovative high-density bike rack requires less lifting when the wheel is placed in the top channel rather than lifting a rack and full bike. Space efficient with minimum clearance required above; 96 inches. Recommended aisle widths of 6 ft, center to center dimensions are 18 inches. This staggered two-tier system organizes most bikes with a user-friendly compact design. These high-density bike racks are the perfect solution for bike rooms, or covered bike parking when combined with our commercial bike shelters. 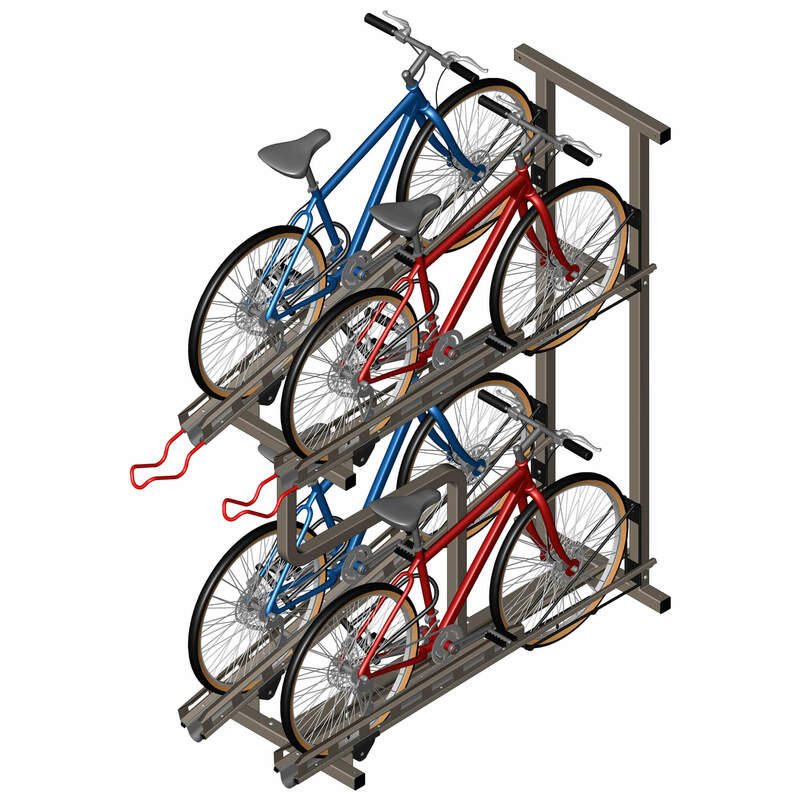 The ideal way to organize bikes in compact areas such as train stations, shopping centers or campuses. Also great for law enforcement bike storage and property evidence bike racks. Watch the CycleSafe Hi-Density Bike Rack video to see how how easy it is to load and secure a bicycle.